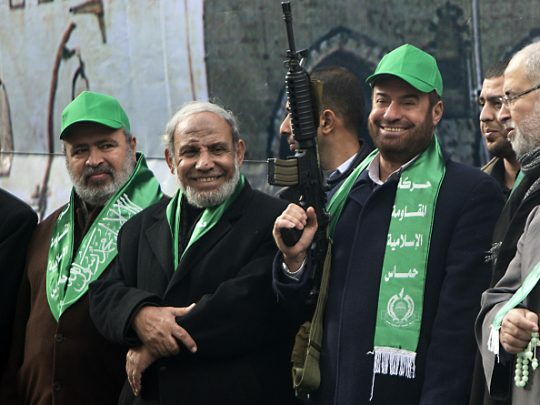 Senior Hamas official Mahmoud al-Zahhar said the riots on the Israel-Gaza border are "not peaceful resistance" but rather, are supported by its "military force." "This is not peaceful resistance," al-Zahhar said. "Has the option [of armed struggle] diminished? No. On the contrary, it is growing and developing. That's clear." The video was flagged and translated by the Middle East Media Research Institute and the interview occurred on the Al Jazerra network in Qatar on May 13. "This is a clear terminological deception … When you have weapons that are being wielded by men who were able to prevent the strongest army in the region from entering the Gaza strip for 51 days and were able to capture or kill soldiers of that army, is this really ‘peaceful resistance?" al-Zahhar asked." Al-Zahhar said talk about peaceful resistance is deceiving the public. "So when we talk about ‘peaceful resistance,' we are deceiving the public," al-Zahhar said. "This is peaceful resistance bolstered by a military force and by security agencies and enjoying tremendous popular support. As for [Fatah's] ‘peaceful resistance,' it consists of rallies, demonstrations, protests, pleas, and requests, in order to improve the terms of negotiations, or to enable talks with Israeli enemy. This deception does not fool the Palestinian public." Israel received international criticism for killing more than 50 Palestinians during the mass protests Monday, but the White House said responsibility for any bloodshed laid with Hamas, the Islamist terrorist group in control of Gaza. Over the past seven weeks, thousands of Palestinians have gathered at the Gaza border for what organizers call the "March of Return." The Hamas-led demonstrations were especially intense on Monday with the U.S. embassy in Israel officially moving to Jerusalem. Some Palestinians, including terrorist operatives, attacked Israeli soldiers with Molotov cocktails and other weapons, and they tried to breach the border fence. Some Gazans have used firebomb-bearing kites to attack Israel, launching them over the security fence, often to set ablaze crops that Israeli farmers are trying to harvest. This entry was posted in National Security and tagged Hamas, Israel, Terrorism. Bookmark the permalink.